Feel the powdery white sand between your toes, hear the sound of waves breaking on the shore and discover the hidden world beneath the ocean's surface. With 7,000km of sun-kissed coastline for you to explore, Australia's Sunshine State promises an outdoorsy holiday that embraces all your senses. Take only pictures and leave only footprints while you appreciate unique beach and marine habitats that never stop changing. 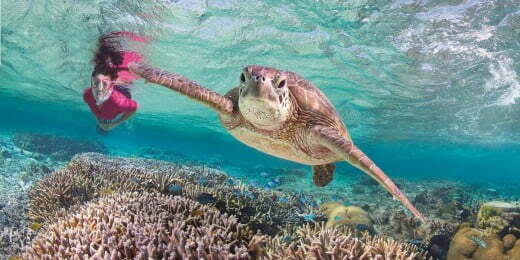 Explore Queensland's Great Barrier Reef, beautiful tropical islands and endless procession of sand beaches. From the board-riding action of the always-spectacular Surfers Paradise beach to secluded spots favoured by the locals, you'll discover some of the top beaches in Queensland on the Gold Coast, each with their own character and quirks of their adjacent neighbourhoods. While it's well-known for ocean surf beaches, the Gold Coast also has plenty of tranquil alternatives. 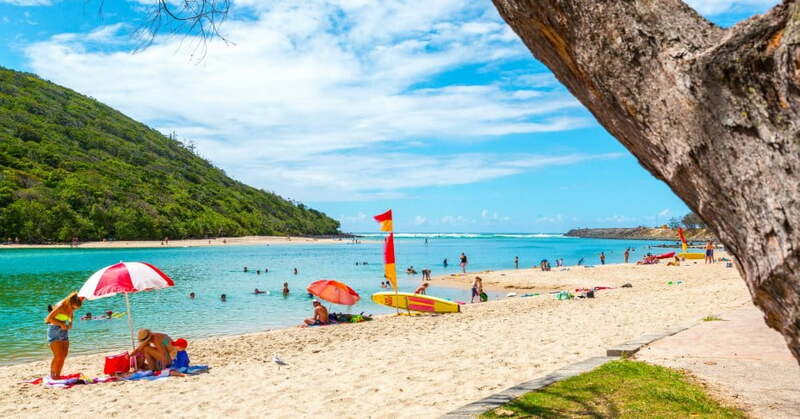 Tallebudgera Creek, a gorgeous river mouth beach is just one example. 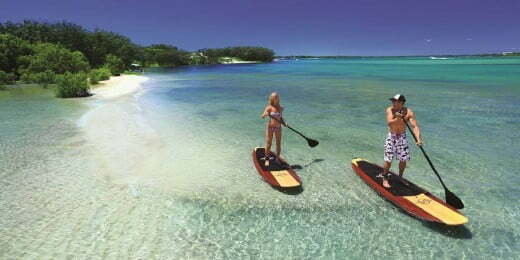 Calm, crystal clear waters make this a perfect spot to hire a kayak or stand-up paddle board. Under your own steam, you can explore along the sandy inner shoreline beneath the Burleigh Heads National Park. 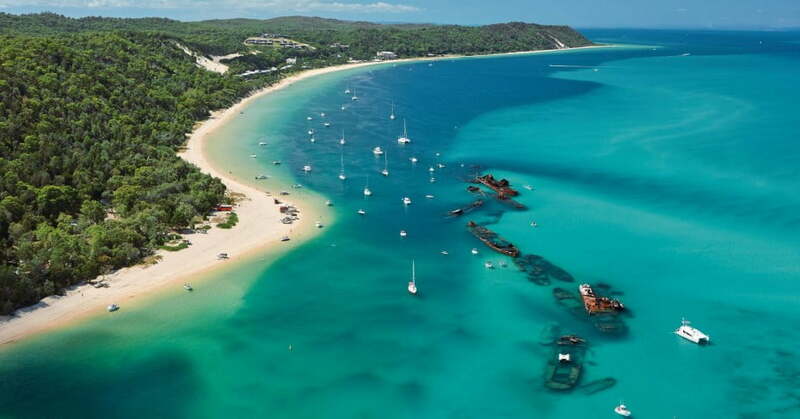 Moreton Island is just 58km off the coast of Brisbane. It's known for four-wheel-drive adventures, whale watching and tobogganing down epic sand dunes. Moreton Island also has a great selection of snorkelling trails that lead to sunken shipwrecks, giant granite rocks, caves and countless fascinating marine animals. Perhaps the most magical experience is the chance to feed the wild dolphins of Moreton Island, which you can do if you stay at the Tangalooma Island Resort. Paddle-boarding at Pumicestone Passage and an early morning surf. Sunshine Coast has some of the best beaches in Queensland, if not the world. It's all about white sand, warm water and not-too-big beach breaks. At Noosa Groyne, surf lessons will have you standing on your board within a day. And if you're already pretty tidy in the surfing department, you can venture into the Noosa National Park to find bigger breaks around the headland, at Alexandria Bay or over the hill at Sunshine Beach. Noosa Main Beach is one of the few beaches along Australia's coastline that faces north and is the beach that is the best option for families. Pumicestone Passage is a paddle-boarders utopia. Get on the water to explore this magical waterway with its array of lush marine life such as dugongs, dolphins, and turtles, and it's a bird-watchers wonderland. This sheltered recreational area is perfect for boating, fishing and swimming, the perfect spot to soak up the Queensland lifestyle. 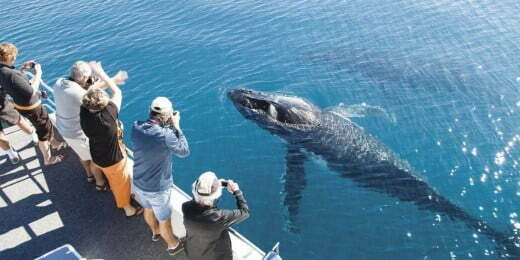 Hervey Bay on the Fraser Coast is whale-watch central from August to October every year. Nothing can quite prepare you for the sight of a humpback launching out of the water just metres from your camera lens. There are all kinds of boat tours on offer, including the chance to snorkel alongside these amazing sea mammals. Just off the coast of Hervey Bay is World Heritage-listed Fraser Island, the world's largest sand island, complete with over 100 freshwater lakes, gravity defying rainforest growing out of the sand, huge sand blows to climb and a 120km beach-highway. 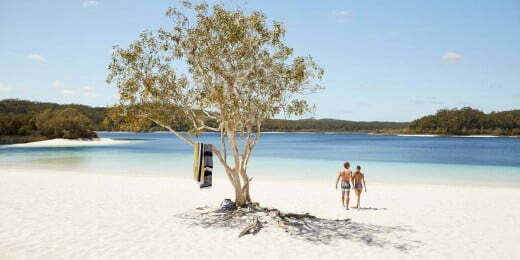 A must-do on Fraser is swimming at Lake McKenzie, which has shores of the whitest silica sand you'll ever see. The water in this lake is 100% rainwater – totally refreshing. Other island highlights include the wreck of the SS Maheno and vast areas of sand dunes – superb Instagram material. Any holiday on Fraser Island wouldn't be complete without a dingo or two. These wild dogs are part of the island's ecosystem and they can often be seen romping on the beach. Fraser Island's other charms include super-starry nights, swimming in the Champagne Pools and floating down Eli Creek. All up, this island is a jewel among Queensland's natural attractions. For the most complete picture of this region, hire a 4WD and do the Great Beach Drive, a road-trip like no other, connecting the Sunshine Coast with Fraser Island and the Fraser Coast. With sand under your wheels and freedom in your soul, you'll have an unforgettable 200km adventure. The Great Barrier Reef is huge; it stretches for 2,300 kilometres from Bundaberg in the south to the tip of York Peninsula. In recent times, the area known as the Southern Great Barrier Reef (just over a 4-hour drive from Brisbane) has become a favourite with travellers who know the difference between an angelfish and a wrasse. Lady Elliott Island, the southernmost coral cay on the Great Barrier Reef, is a highly-rated eco resort and a marine sanctuary home to manta rays and nesting turtles. Other beautiful reef islands to visit include Heron Island, Lady Musgrave Island and Pumpkin Island. Boat trips to these paradise places leave from Bundaberg, Yeppoon and Gladstone. 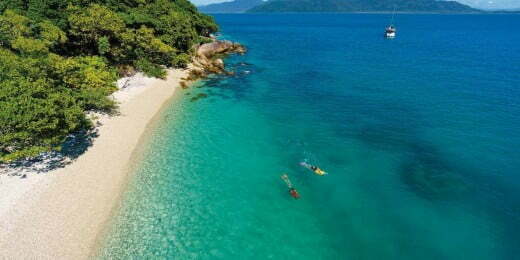 And don't forget Great Keppel Island, with its 17 fabulous beaches. The beaches of Tropical North Queensland are fringed by reef, enveloped by rainforest and are known for coral sand and palm trees. Trinity Beach and Palm Cove offer plenty of accommodation options for visitors; they're also close to the Skyrail rainforest cableway and the Tjapukai Aboriginal Cultural Park. 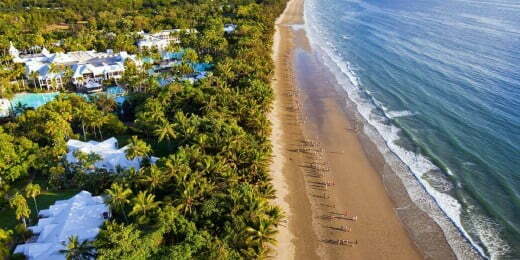 The famous Four Mile Beach in the stylish resort town of Port Douglas has golden sand stretching as far as the eye can see. Tropical North Queensland has a multitude of offshore island paradises scattered all along the coast and are all part of the Great Barrier Reef. From the untouched nature of Dunk Island; indulgent Lizard Island; secluded Bedarra Island; or the family-friendly, easily accessible Fitzroy Island, home of Nudey Beach, consistently named as one of Australia's best beaches. 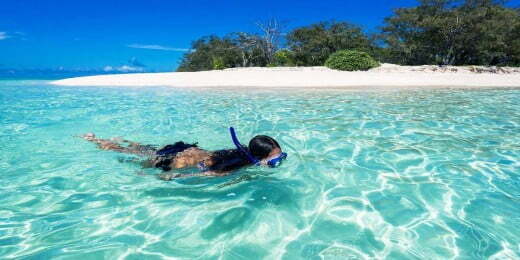 Nestled in the heart of the Great Barrier Reef are 74 tropical islands known as The Whitsundays. Here you can visit for a day, charter a yacht or stay at one of the island resorts. The largest inhabited island of the Whitsunday Islands, Hamilton Island, is the perfect spot for exploring the Great Barrier Reef and world-famous Whitehaven Beach - boasting brilliant white silica sand, alongside Hill Inlet, where the tide shifts the sand and water to create a beautiful fusion of colours – breathtaking. After exploring the clear waters and national park islands, it’s blissful to relax - cocktail in hand - and soak up the evening view. If you're a bit more intrepid, hire a helicopter or seaplane and experience the full scale of the reef from above. It'll blow your mind. For more exciting adventures in the sunshine State, see adventure and discovery in Queensland.